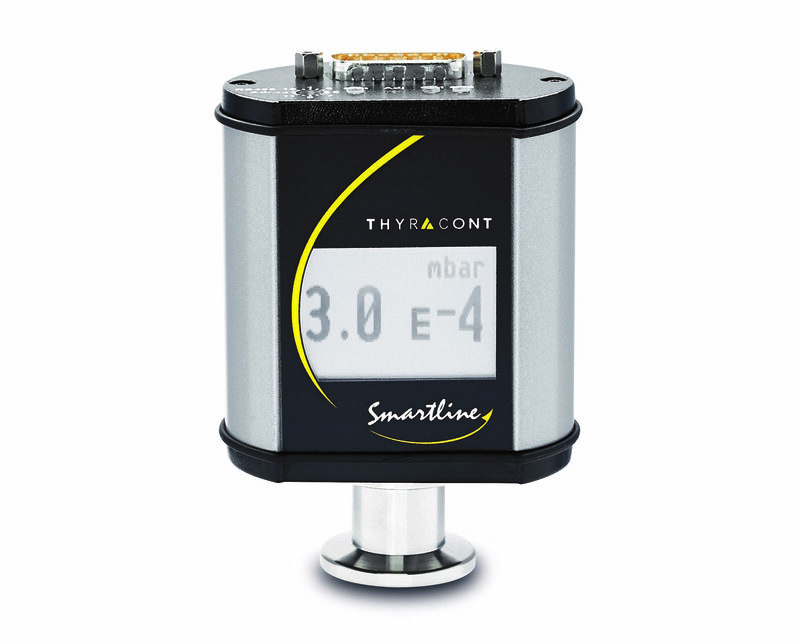 The new Smartline transducer VCP has been developed especially for corrosive media. The sensor with its platinum rhodium filament shows a high chemical resistance, which has been proven by field tests in particularly demanding applications. This is not only due to the robust, industrial-suited product design with protection classes up to IP45 and the stable, interference-free all metal bodies. The resistance and, therefore, the durability of the sensor are maximized in different ways. The Pirani sensor of the new Smartline transducer VCP has a spiral coil filament which is mechanically highly resilient and elastic at the same time. The relatively smooth surface of its platinum rhodium alloy reduces deposits of oil vapors or other contaminations and, therefore, ensures a particularly long lifetime of the filament. The sensor of the VCP is additionally protected by a metal facing. The VCP can even withstand steam sterilization. The helix shape of the filament provides both – a small sensor volume and, at the same time, a large sensor surface which guarantees the outstanding stability. Furthermore, the VCP promises an excellent precision to the user. Its optimized temperature compensation allows exact values, even at high fluctuations between heat and cold. The VCP is especially suitable for applications like freeze drying, heat treatment, coating, vacuum centrifuges, chemical engineering and more. As a specialist for vacuum measurement, Thyracont additionally has a broad range of supplementary protection accessories which are recommended for particularly critical applications, e.g. baffles, wire filters, pipes and spiral pipes. Naturally, the new VCP also offers all familiar benefits of the Smartline product family and is therefore optionally available with an integrated display. The calibrated sensor heads of the VCP can be exchanged by the user in a few simple steps which reduces the maintenance times to a minimum. All of our Smartline transducers are, additionally to the RS485 interface, available with further modern, digital interfaces like EtherCAT, Profibus and Profinet. The customer can furthermore choose the RS485 interface with an analogue 0-10 V output. The 0‑10 V output signal can be scaled according to the required output characteristics. Thus, an exchange of existing transducers, independent of the manufacturer and without programming effort, is easily possible. All Smartline transducers can be connected fairly easy with an USB interface to a PC or laptop. The transducers can even be connected wirelessly to mobile devices with the Bluetooth® adapter (SLKBT). The customer can always keep an eye on his process with the VacuGraph™ software (VGR) for Windows® and Android® and the free VacuSniff™ app.